Sometimes we make decisions for the best possible reasons. But life has a way of doing its own thing in spite of our plans. This is about something like that…. Susan Haworth recently emigrated from South Africa to the United Kingdom. When she moved, she made the decision to give up riding. Difficult decision. “As you can see that did not work out quite the way I had planned,” she said the other day. A few months back, she became the proud owner of Dancing Flame (aka Justin), a very tall European Warmblood cross Irish Sport Horse. First was Magic, who she competed in showjumping and eventing. 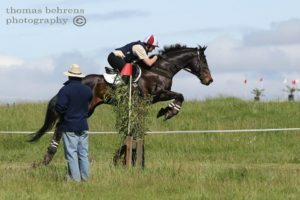 “He had the most amazing temperament, always chilled.” He injured his hock out hacking one day right down to the bone.” After he recovered, Susan gave him to a junior rider. After arriving in the UK, Susan tried very hard to be a non-rider. But after a while she realised that riding was so much a part of who she was that she found herself yearning for another horse. She started to look around. 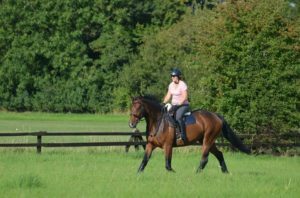 Her basic requirements – a medium sized, sensible gelding with basic schooling that she could quickly finish training and start eventing. What she found was Justin – huge and green and needing masses of schooling.The year before emigrating, Susan got another horse. 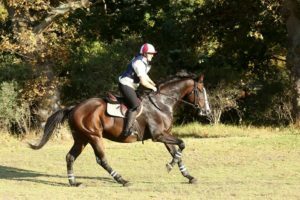 “She was the easiest OTTB I had worked with during the transition phases,” Susan says. She was soon doing basic dressage and jumping, almost ready for her first event, when Susan had to rehome her due to emigrating. “When I rode him though, it was fait accompli. I was totally smitten” she says. Susan’s horses were sponsored by The Herbal Horse in South Africa. Magic used the Farriers mix and Jett was almost unrideable before using the Calm mix. The Herbal Horse had just started exporting to the UK and Ireland market and Beryl Shuttleworth, the owner, thought that Justin looked like an ideal candidate for sponsorship in that territory. Watch this space for more news on Susan and Justin’s adventures in the United Kingdom.